KIEV, Ukraine -- Pro-Russian separatists have been put on “full alert” for a major offensive that Ukrainian and U.S. military officials anticipate will happen in the next two months, a Ukrainian military spokesman said in Kiev, Ukraine, Wednesday. A truck belonging to the separatist self-proclaimed Donetsk People's Republic army moves over a partially destroyed bridge in the town of Debaltseve. Ukrainian military officials and front-line troops say the attack will begin sometime from Orthodox Easter on April 12 to May 9, the 70th anniversary of the end of World War II in Europe. “According to intelligence reports, the leaders of the Donetsk People’s Republic have put their troops on full alert, calling on the militants to return back from health treatment in Crimea, and Russia, as well as in other places,” Ukrainian military spokesman Colonel Andriy Lysenko said to reporters Wednesday. “The enemy is actively spreading rumors about the beginning of active military actions and an attack on the territories controlled by the Ukrainian government, and is trying to accuse the Ukrainian armed forces in advance of disrupting the cease-fire,” he added. Lysenko also said that two Ukrainian soldiers had been killed by separatist fire in the previous 24 hours. Former NATO Supreme Allied Commander General Wesley Clark echoed Lysenko’s analysis in earlier statements made following a trip to Ukraine in March. “Ukrainian forces expect attack within the next 60 days,” Clark said at a March 30 briefing with the Atlantic Council in Washington. “This assessment is based on geographic imperatives, the ongoing pattern of Russian activity, and an analysis of Russian actions, statements, and Putin’s psychology to date,” he added. Ukrainian media and military officials have reported a surge in Russian tanks, weapons and personnel streaming into Ukrainian territory. Andriy Parubiy, first deputy chairman of Ukraine’s parliament, said March 28 that Russia had amassed 60,000 troops on the Ukraine border. In previous statements, Moscow has denied militarily supporting the separatists. The Russian Ministry of Foreign Affairs did not immediately respond to a request for comment. The February 12 cease-fire deal, which was hammered out after 17 hours of tense negotiations between the leaders of Russia, Ukraine, France and Germany in the Belarusian capital of Minsk, has reduced the intensity of the conflict. But fighting has continued daily. More than 100 Ukrainian military personnel have been killed in separatist attacks since the cease-fire went into effect, according to Kiev. The actual number may be much higher, military officials admit, due to losses from a separatist siege on the town of Debaltseve in the days immediately after the cease-fire, which sent hundreds of Ukrainian troops into a chaotic retreat. The Ukrainian National Guard Azov regiment, which has about 1,000 personnel, has reported more than 40 wounded personnel since the cease-fire began. Overall, the conflict has killed more than 6,000 people and displaced more than one million from their homes, according to the United Nations. While international monitors from the Organization for Security and Cooperation in Europe (OSCE) say the cease-fire is largely holding, despite repeated violations, Ukrainian military officials are making preparations for what many soldiers refer to as the next “active phase” of the conflict. Across Ukraine, defensive fortifications are being built with an early May deadline. In Mariupol, a southern port city on the Sea of Azov, a network of trenches is being dug along the city’s beaches to defend against an amphibious attack. And 31 machine gun pillboxes are being constructed in the region around Kharkhiv, Ukraine’s second largest city. In total, according to Ukrainian officials, more than 300 defensive fortifications are being built along the contact line with separatist troops in eastern Ukraine. 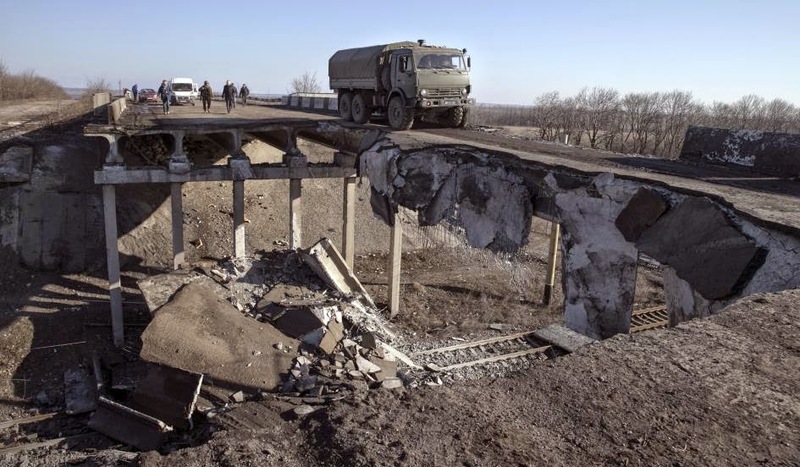 “We have very limited time for this work—we must build all fortifications until mid-May,” Deputy Prime Minister of Ukraine Hennadiy Zubko said March 19, according to the Ukrainian news agency Unian. “The situation is tense, and we must combine not just the efforts of the military and regional administrations, but the efforts of all Ukrainian citizens to address the problem,” he added. Ukraine is also boosting its military manpower, nearly doubling the size of its regular army. According to the Defense Ministry, Ukraine is looking to add 103,500 new soldiers in 2015, bringing the total size of its armed forces to 250,000. Across the conflict areas, fighting has gone on almost non-stop since the truce was signed in February. The overall intensity of the conflict has diminished, but fighting has remained heavy at certain hotspots, such as outside the separatist stronghold of Donetsk and the government-held city Mariupol. On the outskirts of Mariupol separatists and Ukrainian forces have been skirmishing for more than seven months. The nearby town of Shyrokyne has been nearly destroyed by heavy weapons banned under the cease-fire’s terms. “Not one building had been untouched by the many weeks of shelling,” Chief Monitor of the OSCE Special Monitoring Mission to Ukraine Ambassador Ertugrul Apakan said March 27, referring to damage in Shyrokyne, according to an OSCE statement. The United States recently announced it was sending paratroopers from the U.S. Army’s 173rd Airborne Brigade based in Vicenza, Italy to train the Ukrainian National Guard. The training will be conducted in the western Ukrainian town of Yavoriv, more than 800 miles from the conflict areas. The U.S. soldiers are expected to arrive in Ukraine at the end of April.